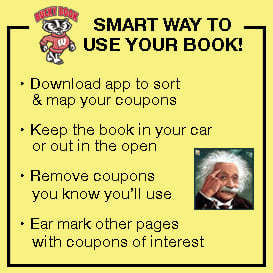 Earn $12 to $15 per Bucky Book sold! On Consignment, No Risk! No upfront costs, no minimum to buy, only pay for what you sell & return the rest! Reimburse Your Contributors Through Savings! 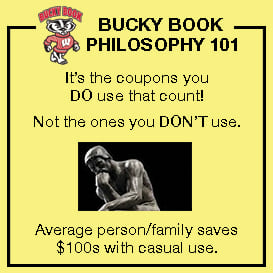 Once your contributors save $35 with their Bucky Book it hasn’t cost them a dime to support your cause – in fact, the average family saves $100s! Easier Every Year! With the savings realized by contributers you'll experience return customers and referrals every year. INDIVIDUAL BONUSES! Motivate your volunteers with 1 Free Bucky Book ($35 value) with each 5 books they sell! They can keep it, give it as a gift or resell it for themselves or the group! Superior Customer Service! We’re a local, Madison based company with an experienced and helpful staff. Supplement Coupon Book for “Outlying Areas!” Our outlying community fundraising partners receive a FREE, additional compact coupon book which adds more local value to the Bucky Book making your sales that much easier. 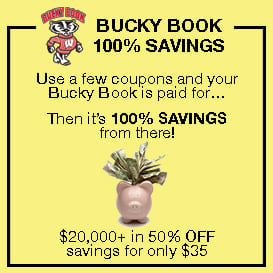 Thank you for considering The Bucky Book to help raise funds for your organization. The Bucky Book Fundraiser raises $1000s every year per group AND WE HAVE THE TRACK RECORDS TO PROVE IT! Please contact our Fundraising Department at anytime to arrange a meeting, discuss the possibilities further or for any questions. Download the "Letter of Intent" to lock in your position for the Bucky Book 28th Edition Campaign Fall 2019!